The cooler weather has given Oscar a new lease of life. “We have lift off!” they seem to be saying. And hoping I won’t be able to find him. For more playful creatures, please visit: Camera Critters. Posted in Camera Critters, dogsTagged autumn, ball, camouflage, golden, golden retriever, leaves, playBookmark the permalink. Oscar on the carpet of leaves, it looks great. Oscar in winter is always the most gorgeous! He’s so beautiful, and Fi, I swear he poses! I love him! Beautiful portraits! Love the first photo of Oscar ready to play ball, but I also like the one where he is hiding in the leaves! Wonderful captures of Oscar!! Makes my morning to see him having such a great time! I do so miss my dog, Sam!!! Hope you both have a great, fun weekend!! That is one happy dog. Great shots. I especially like the one where Oscar is camouflaged among the leaves. Oh, that reminds me, I need to go outside and rake up the fallen leaves – Dang it!!! ha. nice camo….smiles…i am always ready for a game of catch…. These are great photos of Oscar. Frosty days seem to give him a lot of youthful energy. What a happy pup! Beautiful captures of Oscar. Oscar always reminds me of our two Goldens, both deceased. The sweetest dogs ever. Oscar almost has an ethereal look about him. Quite touching. He is such a handsome dog! Oscar needs to come here where the leaves are knee deep – he’d be in heaven. Lovely to see him looking so fit, well and enjoying life. Thanks Marie! Hope your Princess is doing well too! Beautiful are the photos of Oscar! 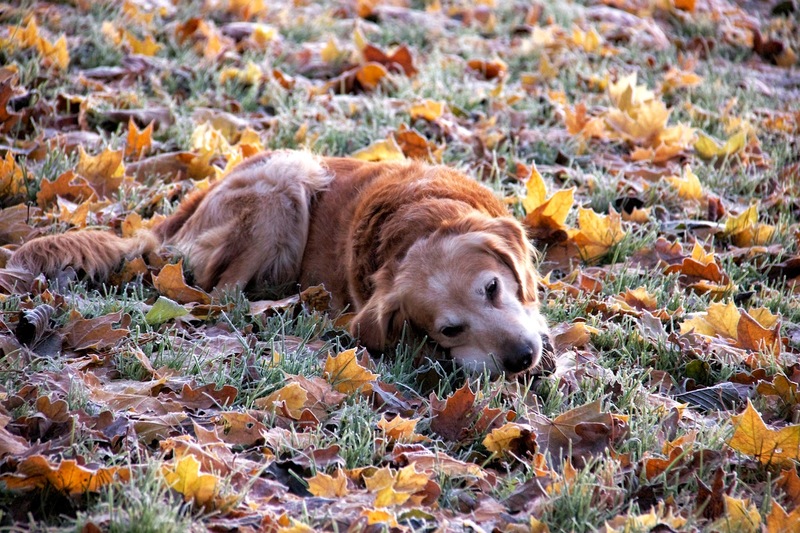 And a golden retriever has such an advantage hiding in autumn leaves…! Gorgeous shots of Oscar! He’s a very happy dog. Aah …. the simple pleasures of life! Our four-legged friends have a way of reminding us of these, don’t they? …. and they bring such joy to our lives. (I’m with Oscar – the cooler weather brings me out of “hibernation” and encourages activity!) Happy weekend Lady Fi. Your dog seems extremely happy. He is a joy and a delight. I love these shots of Oscar. Sweet! Sophie feels the same way as Oscar! So cute how he hides in the leaves! We’ll be outdoors this weekend too. I felt cheated last weekend because it rained. That dog has heart and soul. He is my hero. He is up there with Hilary’s Bennie in my book. I wish you would make an Oscar calendar so I could buy multiple copies and spread the joy that is this dog–everywhere! I do have a couple of calendars up on Red Bubble, but perhaps I should make a newer one as I have a lot more photos now. What a sweetheart. 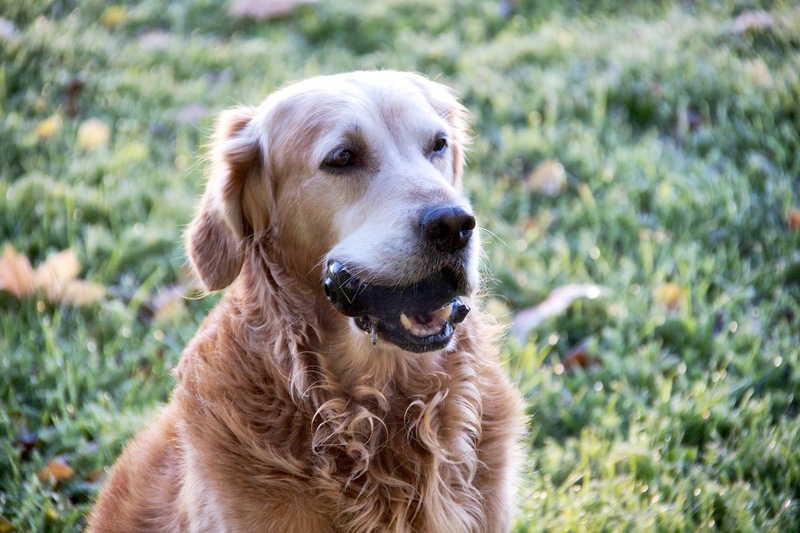 It’s pretty amazing how retrievers can hold the whole ball in their mouths like that. Love it. Oscar i such a beautiful dog. I love the photo with the flapping ears. Its a great shot, capturing the beauty of autumn and him. Oscar is sure having a lot of fun!! Oscar in action, lovely shots! Oscar is adorable – I can imagine he’s not as lively in the summer with that thick fur coat. We haven’t had frost yet, so I am envious!!! I love that image of Oscar taking off!!! Oscar is the cutest dog in the network. So it says your photos. Your dog is a beauty. Great shots of the frost. Oscar and the leaves are matching. I lost my Golden 8 years ago. Today, I cleaned out her old toys and tennis balls. It was hard. Beautiful shots! Oscar is a gorgeous dog. Your dog looking in funny mood!!! Yes, the leaves really do smell like nutmeg!! Soak that Autumn up while you can! Winter is a comin’! Oscar will love it then too of course. He’s so beautiful!! I love all these shots but particularly the one of him in the Autumn leaves! What a beautiful Retriever! Love these shots! Your dog looks so sweet and cuddly!! Great pic with the ears flying!! What a gem he is! Lovely pictures. Between the invigorating temps and colors that match his fur, Autumn is definitely Oscar’s season! 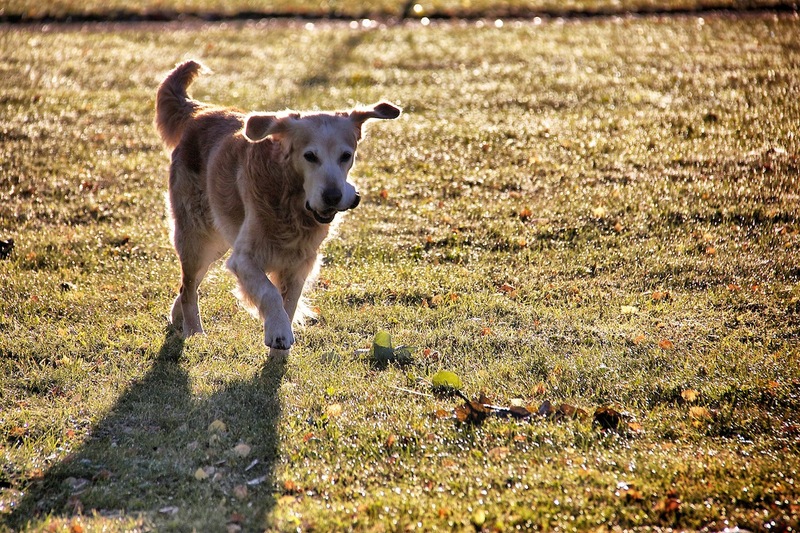 I adore that photo of him running through the sunbeams with ears a’flappin’!! Such joy! Awesome shots of handsome Oscar! I like the title you gave the post – it fits so well!